It's not easy to keep all your employees happy, but these chief executive officers seem to have figured it out. 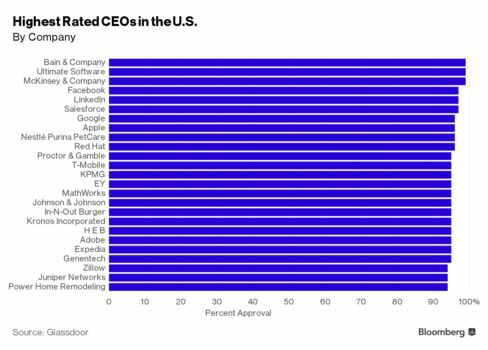 The CEOs of Bain & Company Inc., Ultimate Software Group, Inc., McKinsey & Company Inc., Facebook Inc., and LinkedIn Corp. took the top five spots a just-released list of the highest-rated CEOs in the U.S. According to a report from career website Glassdoor, each of the CEOs had an employee approval rating of 97 percent or higher. Last year, Google's Larry Page took the top spot and women were absent from the top 50. This year, four women made the list. The highest-rated female chief executive was In-N-Out Burger’s Lynsi Snyder at No. 17. Staffmark’s Lesa Francis, Enterprise Holdings’ Pamela Nicholson, and Deloitte’s Cathy Engelbert also made the top 50. Other well-known CEOs making their first appearance on the list include Nestlé Purina PetCare’s Joseph Sivewright at No. 9, NBCUniversal’s Stephen Burke at No. 39, and lululemon’s Laurent Potdevinat in 48th place. Here is a look at the top 25. Some leaders haven't found the key to keeping employees satisfied, but they came close. Fidelity Investments' Abby Johnson and Chick-fil-A Inc.'s Dan Cathy both had employee approval ratings of 92 percent. Twitter Inc.'s Jack Dorsey had an 88 percent rating, and JetBlue Airways Corp's Robin Hayes had an 87 percent rating. With a lot of uncertainty about the future at Yahoo! Inc., CEO Marissa Meyer received a mere 64 percent approval rating. The report is based solely on the input of employees who anonymously and voluntarily provide feedback through Glassdoor, and the CEOs are then ranked according to their overall approval rating from the past year.